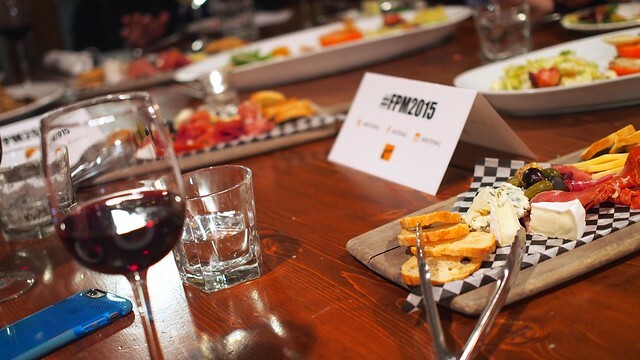 Interac dinner tasting at The Flying Pig's Side Door dining room in Gastown on February 25, 2015. Did you know March marks the 11th anniversary of Fraud Prevention Month in Canada? Me neither. 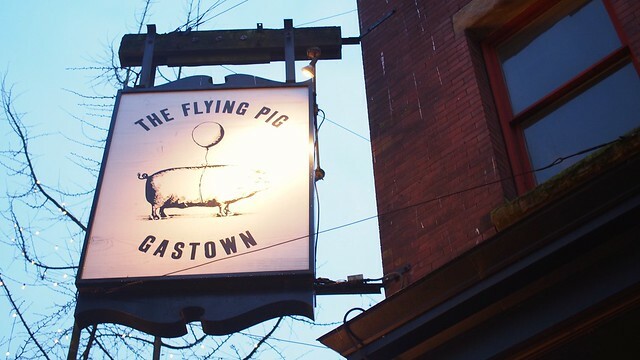 On this occasion, Interac (a proudly Canadian company) invited a few of us to discuss bank/debit card security and fraud management over a dinner at the Gastown location of The Flying Pig, fast becoming an upscale dining franchise in Yaletown and now, Olympic Village, as well. I really enjoy the darkly lit, romantic vibe of the corner Gastown eatery with its historic surroundings and walk by traffic. The Side Door backroom is a nice private space for an intimate dinner among your company. 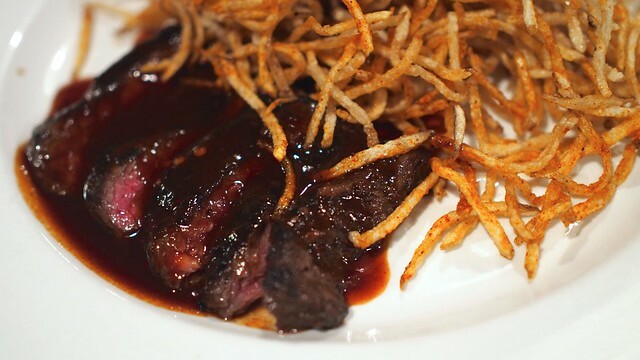 We savoured over the red wine braised beef skirt steak dripping in sauce. A nice combination of savoury meatiness and fried crunch of the potato sticks. We were treated to some fine cheeses and charcuterie on the artisan meat and cheese board as well as a tasty tomato burrata. 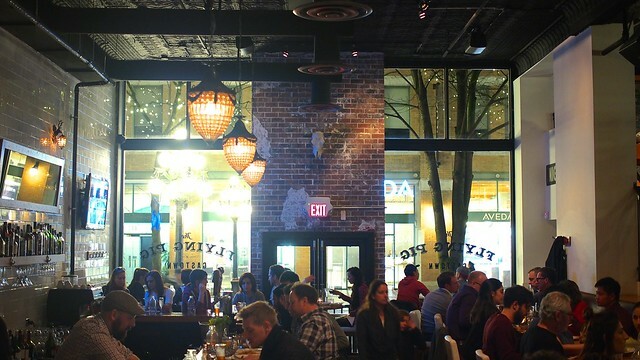 Flying Pig does the standard upscale dishes well. Onto the massively opulent entrée platter, served family style, we dined on the insatiable lobster risotto, well-cooked blackened steelhead trout, heartily satisfying skillet roasted striploin steak, and serviceable veal piccata. 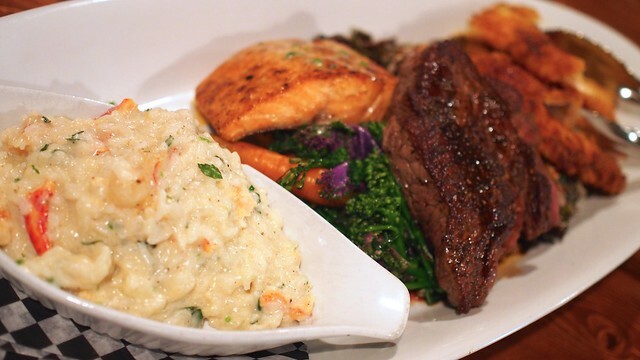 I could not get enough of the risotto and steak personally as deliciously cooked staples. For dessert, we made room for a sweet trio platter full of crème brûlée, fondant cake, and lemon tart. 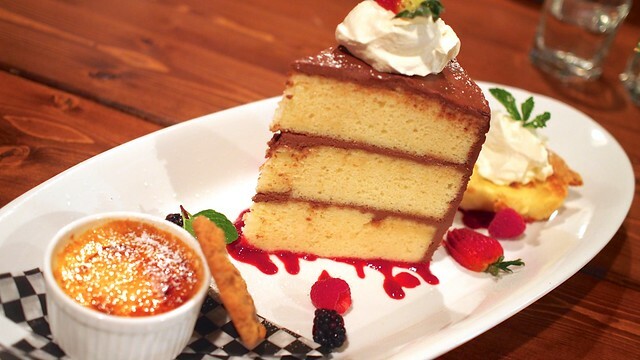 I was particularly enamoured with the simple yet still delectable cake with its sweet but restrained flavour, while neither the crème brûlée or lemon tart were slouches in their tastiness. 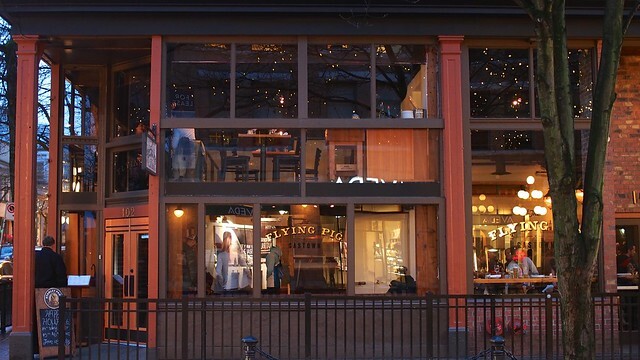 It was a lively and delicious private dining experience in Flying Pig's Side Door private dining room. And remember to practice safe payment habits. Fraud often happens at the merchant or machine that you frequent most. Interac crime is not petty crime; it’s organized crime, and companies work hard to stop it. Interac Flash is protected against electronic pick pocketing, so it’s one of the safest way to carry a card around. It does not contain account numbers and cannot be used to produce a counterfeit card or transaction.